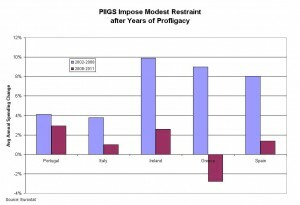 Thu 5/24/12 4:27 PM – What European Austerity? All you hear on the news is that Greece is being killed by Draconian austerity measure forced on them by Germany and other financiers of Greece’s enormous debt. Actually, as far as actual cuts in spending are concerned this drastic, crippling austerity worthy of riots is largely a myth. 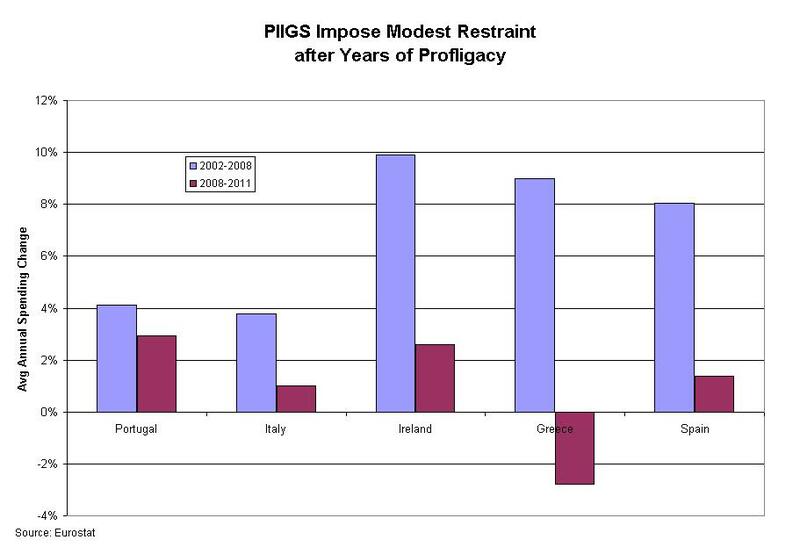 See the chart below from the Forbes Magazine article entitled, Paul Krugman and the European Austerity Myth by Paul Mitchell (May 8, 2012). Yes, only Greece has actually cut spending since 2008 and that was by a total of less than 3%. This is one of my worst pet peeves, the claim that reducing the rate of spending increases constitutes a spending cut. A real spending cut is spending less than the previous year, but that is not what is going on for the most part. I blame the media’s laziness and bent for riveting hysteria for the nearly universal propagation of this “spending cut” myth. What austerity actually exists in Europe is the raising of taxes to help close the deficit. Most European countries like Greece, France and Italy have raised taxes on very high income earners and raised the VAT rates. With the recession now going on in Europe, one that will be deeper than expected, you can see two things. 1) Growth in government debt-dependent spending during the early and mid 2000s was completely out of control and that was what was formerly fueling growth. You can see that from the chart and from the fact that in the UK for example, government spending is 49% of the entire UK economy; call it half. Wow! Excess dependence on government is a topic I should discuss in another post. 2) Raising taxes on the rich does not help the deficit. Despite tax increases on the wealthy, tax collections in Europe continue to decline, even with concurrent increases in VATs. Why? One reason is that the wealthy have the ability to change their spending behavior and circumstances to avoid much of the tax increase. Another is that the wealthy are a very small part of the population. Another is that taxes reduce the amount available to spend and dampening consumer spending slows the ecoomy, leading to less income and less tax revenue. A 4th is that when you raise the VAT, a form of sales tax, you make goods more expensive at the same time people have less income. Voila – even less spending. I hope the US is paying attention but I fear not. In any case, this Greek tragedy has some time left to run and the way the play unfolds will continue to affect US markets.